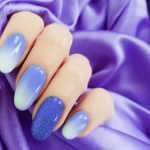 Those intricate little scenes painted across fingernails and posted all over Instagram are super easy to recreate with the right tools. 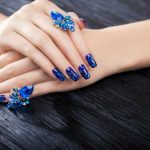 If you’ve always stared enviously at those flawless nail art designs, here’s what you need to make your own. Of course, there are lots of different accessories available that can make the job a lot easier, but you can’t do a decent job without these three items. Now for the tricky part – roll your stamp over the image lightly. If any extra polish is lifted with the image, clear it away gently using the scraper. If the image one your stamp looks good, go ahead and apply it to the nail of your choice, but be quick. It’s important to apply the image to your nail before the polish dries on the stamp. Once cured, or dry, apply several coats of top coat, and you’re done! There are many, many stamping kits on the market; here’s my review of the top five. 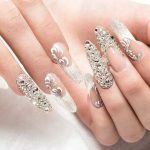 These designs are simply beautiful – the delicate tendrils and petals will make your nails into a work of art. The plates are etched really well, even on the finest bits, producing lovely, clean images, with perfectly crisp lines. The blue plastic covering is hard to remove in one go, but it’s not an issue. Delicate, unusual designs worthy of the best catwalk. This kit has a nice variety of designs – flowers, graphics, tribal and more, and contains 10 stamp plates, a stamper, and a scraper. The etching are deep, with the stamp transfering easily and cleanly to your nail. It’s a shame that this doesn’t come with instructions. Containing everything you need to get stamping, this is a great kit at a good price. ★★★Quality Guarantee - Makartt nail art stamp plate set made with resuable plastic, ensure the quality of product. ★★★Fashion Design - Stamping plates designed with different patterns which meet various needs. Some of the stamps have sharpish edges, but for me, that doesn’t detract from this kit. For a good starter stamping kit, this is great. Mix 10pcs different design stamping nail art plate (about 6x6 cm). Remove blue film carefully and be aware of plate edge. One of the plates was slightly too shallow, but the others more than make up for it. This awesome value-for-money set would fit perfectly in anyone’s manicure kit. All of our nail art plates are made of high quality 304 stainless steels. With 144 designs to choose from, there’s something for everyone here. Coming with a pretty storage case, the stamps are well sanded, allowing the color to go on smoothly and transferring to your nails perfectly. One or two of the designs are a bit close to be used properly, but with such a large amount, it’s no great loss. If you are looking for really unusual designs, and a budget friendly kit, this one is easy to recommend. Newest Unique Nail Art Image Plates Designed by PUEEN - Now comes with the storage case (color of case is sent randomly)!